There were just enough moments of dazzle and dominance in this past Saturday’s (Dec. 7) women’s hockey match-up at the Bright Hockey Center that host Harvard appeared to be playing against an ice version of the Washington Generals – that hapless squad of fall guys made infamous by the Harlem Globetrotters. Though for the No. 1 nationally ranked Crimson, the 4-0 shutout against Northeastern (5-8-2) was no trickery. In fact, at 9-1, the Crimson’s success in the opening third of the season has been largely due to the execution of some tried and true fundamentals: puck movement, ice awareness, timing, and teamwork, the last of which comes courtesy of a talented trio of Olympians. Together, freshman sensation Julie Chu, junior defender Angela Ruggiero (who captured, along with Chu, silver for the United States in Salt Lake City), and Canadian gold-medal winner Jennifer Botterill ’03, have bolstered an already stellar team. To fully appreciate how well this group is clicking, consider that 10 games into the season the Harvard pucksters have outscored their opponents by a total of 56-7. Against the Huskies, senior Tracy Catlin – named to this week’s Eastern Collegiate Athletic Conference (ECAC) Honor Roll – notched a goal and two assists. Twenty seconds after stepping onto the ice, the right winger fired a shot past several Northeastern defenders to take the 1-0 edge. In the second period, Ruggiero put Harvard up 2-0, splitting a pair of defenders with an unassisted wrist shot. Heading into the second intermission, Kat Sweet ’05 took a pass from Catlin to deposit the puck past Huskie goalie Chanda Gunn. Chu chipped in a rebound shot for her ninth goal of the season to ice the 4-0 win in the final stanza. National scoring leader Botterill (3.3 points per game) bounced No. 7 Providence College (9-4-3) the following night in overtime, scoring a breakaway goal with 16 ticks remaining to notch her second tally of the game. The OT-goal lifted Harvard past the Friars, 2-1. 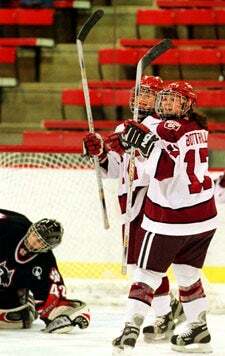 For her game-winner, Botterill was named the ECAC Player of the Week for the third time this season. Harvard netminder Jessica Ruddock ’04 recorded 20 saves against Providence to keep the Crimson alive. The Crimson host No. 5 New Hampshire and Maine on Friday (Dec. 13) and Saturday (Dec. 14) at 7 p.m., before breaking for Christmas. Harvard resumes play on Jan. 4 when it hosts Wayne State for a 7 p.m. game.